Food expenditure is one of the biggest contributors to a household’s monthly budget. According to the Bureau of Labor Statistics, the average American household spends $7,203 per year on food. This is by far the largest expenditure, followed by transportation, insurance and pensions and healthcare expenditure. If you’re trying to live on a smaller budget, spending this much money on food will be either impractical or altogether impossible. At the same time, many families worry about meal planning on a budget. Budget meal planning does not mean compromising quality for the sake of a price reduction. There are money-saving meal plans out there that will result in delicious, nutritional and healthy foods for the entire family. Making your first steps in the world of budget meal planning may be difficult and confusing at first. The following guide will acquaint you with some of the essentials to follow in order to build a personalized routine. Check out this article to find out some of the best and easiest ways to get free food! To determine how much food is going to cost you, come up with a weekly or a monthly menu. Decide what you’re going to make for breakfast, lunch and dinner each day. Based on this information, you can also choose ingredients and determine how much each meal is going to cost you. To reduce the cost of ingredients, you can approach menu planning in a couple of ways. For a start, look for meals that can be prepared with seasonal ingredients. Local and seasonal products are much more affordable than exotic imported or packaged goods. Checking what you have in the pantry, refrigerator or freezer will also simplify the process. Use the ingredients already in your possession and buy a couple of additives to put an entire meal together. When you have a plan and you stock up on the necessary ingredients, you’ll be much less likely to opt for takeout or convenience foods. Numerous surveys suggest Americans are spending ridiculous amounts of money on takeout foods. An average American will spend $70,000 on takeout food in their lifetime! Nearly 82 percent of the respondents in the survey opt for takeout food at least twice per week – a habit that’s putting a lot of burden on the family budget. Simple and efficient meal planning, as well as the preparation of food at home, will reduce the amount of money spent on ingredients and foods significantly. Once you do the weekly menu plan, you can start looking for additional ways to spend less on food. Smart grocery shopping is the next essential to master if you want to do effective budget meal planning. Coupons are a great choice to reduce expenditure on one condition. Make use of coupons for stuff that you really need. If you have a coupon for items you don’t need, there’s whatsoever no use in the discount. It will force you into expenditure you weren’t anticipating. When shopping, look for a number of staples that can be utilized in more than one way. A whole chicken, for example, could be used in the preparation of several meals. The chicken breasts can be turned into a stir fry with rise. The rest of the meat can go into a stew or a hearty chicken soup. Finally, choose shopping opportunities that can make you money. Yes, there are grocery shopping options out there that earn you points when you purchase certain items. Ibotta is one opportunity that helps you make real money when you shop. The platform has countless cash back offers and partners with multiple vendors all over the world. All you have to do is download the app, select the offers you’re interested in, and simply upload your receipts to get paid. For more information about how this program works, check out our Ibotta review. Click here to sign up for Ibotta, get a $10 signup bonus and start getting cash back on your purchases! Options like Shopkick are even more lucrative. Learn more about Shopkick from our comprehensive review. With Shopkick, you can make money without shopping – all you need to do is scan items at the grocery store. Shopkick is free to join and according to its official presentation, the program has paid out nearly $80 million in gift cards and rewards. The program is available at thousands of grocery stores and you can get rewards by visiting a physical location, making a purchase or scanning items. Start earning money by joining Shopkick for free today! Are you making use of every single morsel of food in your fridge and pantry? When learning how to meal plan on a budget, you will need to unleash your creativity. Leftovers are an incredibly valuable resource that can quickly be incorporated in a new meal the next day. Food waste is a serious problem and an issue that’s having a profound effect on the family budget. In the U.S., food costing over $160 billion is wasted every single year. One pound of food is wasted per day, meaning that approximately 20 percent of the purchased food is thrashed each year. Leftovers can turn into a staple of budget meal planning. Let’s go back to the chicken example. If you’re grilling some chicken on Sunday, use the leftovers to make sandwiches for school or work lunches on Monday. Even the chicken bones can be utilized to make stock or a delicious soup. Make sure that your leftovers are properly stored and refrigerated to ensure food safety. It may also be a good idea to freeze leftover meals for usage later on. Just make sure that the particular type of food isn’t going to change its taste and nutritional qualities after freezing and thawing. 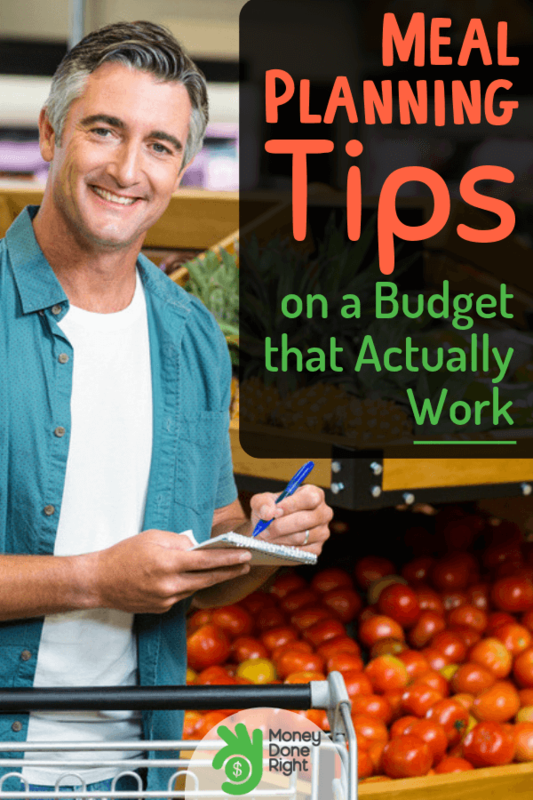 To save more money on groceries and save your family a lot of money in shopping expenses, check out this post. Meal planning on a budget should also put emphasis on finding free of charge ingredients. If you do some research, you’ll actually come across ways to get some products for free. The first thing to do is to check the websites and social media of big food brands. Often, these companies organize promotional events that feature free samples and food giveaways. This is particularly true in the case of a new product being introduced. It’s also possible to discover online freebies. If you sign up for Graze snack deliveries, for example, the first box will be brought to your address 100 percent free of charge. Food waste supermarkets are also a real thing. The concept originated in the UK but it is making its way to the US now. One of the first such opportunities is available just outside of Boston. The location relies on donations and special bulk discounts to make groceries incredibly affordable. Some of them are available for as little as one dollar! There are many additional ways to get food for free. Check out the following guide for 10 great ideas. The healthiest and most affordable meals feature foods and ingredients you’ve grown on your own. Starting a little vegetable garden, even if you live in a small urban apartment, is far from a mission impossible. This is one of the best ways to eat healthy budget meals. Salad greens, for example, don’t require an awful lot of space and they grow really fast. A standard bag of salad greens costs approximately $3. A packet of seeds has approximately the same value. Each packet contains 500 seeds and more. You will be planting them multiple times and enjoying dozens of harvests. It’s easy to see how this approach is much more cost-efficient. Apart from being more affordable, fruits and vegetables you cultivate on your own are going to be 100 percent organic if you refrain from using pesticides and fertilizers. Start with some of the plants that don’t need an awful lot of care and that will produce the ingredients you need the most. As you gain some gardening experience, you can increase the scope of the experiment and try cultivating various other species. Always opting for the same brand is making it more difficult for you to do budget meal planning. There are many products that can be replaced for generic brands or the supermarket’s own brand without sacrificing quality. Canned and frozen fruits and veggies are two excellent examples. Here’s a simple calculator you can use to determine how much money you’re going to save by opting for the generic supermarket product rather than the branded variety. Research suggests that the average family can save approximately 25 percent of their food budget by opting for the generic item. Some of the items you can easily buy generic without any disappointment in the quality of the alternative include mineral water, seasoning and spices, milk, juice, frozen fruits and veggies, canned fruits and veggies, baking soda, sugar, snack foods, cereals, and even fresh produce. Another substitute that can save you money focuses on the type of meat you buy. Going for a less expensive cut of meat is one of the cleverest meal planning on budget hacks. Chicken thighs are less expensive than chicken breasts and many people find this type of poultry meat much juicier and tastier. Pork cheeks and belly, shin of beef and lamb neck fillets also rank among the most affordable cuts of meat out there. All you have to do is identify the right preparation method. If you have a Crock-pot or a pressure cooker, you will be enjoying delicious meals that taste the same as in the case of buying expensive cuts. Don’t be afraid of fatty cuts – there is a lot of new research out there suggesting that animal fat is actually healthy. A final option to try is organ meat. Organ meats can produce delicious meals and they’re staples in the national cuisine of many countries. The organ meat is also a healthy choice – these cuts are packed with healthy nutrients and vitamins. While generally avoided in Western cuisine, liver, tongue, heart, sweetbreads and even brains can produce fulfilling, delicious meals. Take some time to explore recipes and experiment in the kitchen. If you embrace the alternatives mentioned above, you may expand your culinary horizons and save money at the same time. For a lot more money-saving cooking tips and kitchen hacks, check out this article! Budget meal planning focuses on just about every aspect of food preparation. You need to have a plan when it comes to side dishes. A side dish can be an expensive addition to your meal. There are various types of healthy and fashionable ingredients right now (emperor’s rice, quinoa, exotic veggies) that are quite costly to prepare. For best results and easy, cheap meal planning, you should have a list of default side dishes. Veggies are an obvious choice. You can buy an extra-large bag of frozen vegetable mix to save money. A single bag will give you multiple side dishes and convenience. Once you buy and store it in the freeze, you’ll know that you have an option readily available. The same applies to rice – another ingredient you can buy in bulk in order to save some money. Salads are a third healthy and budget-friendly side dish option. When you do the weekly menu, you can determine just how much salad the family is going to need. Through the calculation, you can once again buy in bulk and save a few dollars. Obviously, you can mix things up every now and then to add a bit of diversity to your meals. The bilk of side dishes, however, should be accounted for in the weekly or monthly plan. This way, you will avoid getting into additional expenditure by having to do last-minute purchases. Shopping at the farmer’s market adds a whole new level of excitement to the produce acquisition process. While farmer’s markets feature fresh, local and seasonal ingredients, they can be expensive to visit on a regular basis. This isn’t necessarily the case all the time. Knowing when to visit the farmer’s market will help you save some money on the acquisition of your fresh, healthy produce. Visiting farmer’s markets in the end of the day is the best choice if you want a budget purchase. While the number of options will be limited, the odds of scoring a great bargain will increase exponentially. Go to the market approximately an hour before the closing time. Sellers want to unload as much as possible without having to throw away food. As a result, they’ll be more likely to offer you a lower price. It’s also possible to get an extra few products thrown in the bag at the last minute. Don’t be afraid of visiting venues, shops and markets recognized for a somewhat higher price tag. There are ways to benefit from a bargain there if you are patient and you have the right approach. Don’t feel motivated to save money on groceries? Here are a few scary financial statistics you might not be aware of. If you’re not a culinary master or you’re making those first steps in the world of meal preparation, you may be oblivious about the cost of ingredients. Educate yourself and start with cheap cooking resources. There are ingredients you can stretch to make many meals and staples that cost next to nothing. There are food preparation methods that reduce the expenditure even further. Do a bit of online research to get started. Websites like Feast on the Cheap offer tons of affordable recipes. The same applies to Budget Bytes. Take some time to understand the aspects of these recipes that make them budget-friendly. With time and practice, you will acquire knowledge about the best ingredients. You will also get to personalize the recipes so that all family members are satisfied with the meal you’ll share. Online resources will also give you an idea about the utensils, cooking equipment and appliances you will need. A slow cooker, for example, is one of the absolute essentials for budget meal planning and cooking. Slow cookers allow for the creation of nutritional, easy and delicious meals. All you have to do is get the ingredients and throw them in the crockpot. Don’t be afraid to get out of your comfort zone. Swapping some ingredients, going to grocery shopping places you’re not used to and experimenting with new food preparation methods can yield wonderful results. To do effective budget meal planning, however, you will have to be organized. Getting to know ingredients and just how versatile they are is also going to be beneficial. Click here for a comprehensive list of 51 cooking tips and kitchen hacks that can help you save more money. Start trying them out today! Are you used to saving money and cooking delicious meals at home? What techniques do you rely on to reduce the family food budget? What are your favorite recipes? Don’t be afraid to share your secrets with us in the comments below.